"My son Steve made this for us, and I was blown away by how easy it is and how awesome it tasted!" 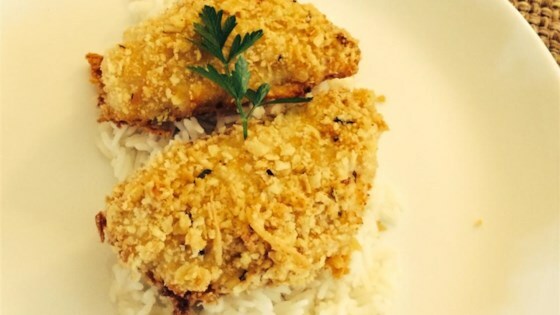 The nutrition data for this recipe includes the full amount of the butter and breading ingredients. The actual amount of butter and breading consumed will vary. I don't usually make Perch, so I looked for a recipe and found this. My family and I did not like the breading. Won't be making it again. I did a dairy free version with no cheese and coconut oil instead of butter. It turned out beautiful, dairy-free, and delicious! Great Recipe. Only thing to be careful of is the time in the oven. 25 to 30 min is far to much for small perch. I do 15-18 min. Also Panko Breading was awesome!